This unit of work was created in partnership with The Garret and accompanies their interview with Thomas Keneally. Please click here to access the Interview, Bibliography, Show notes and Transcript, and Author profile. The following activities and tasks have been designed to be studied and used in full or in part, depending on the teaching context. The activities have been formulated for use with a whole class or small groups, and a suggested grouping is individually noted in each activity. All activities can be adapted to suit smaller groups or individual students. 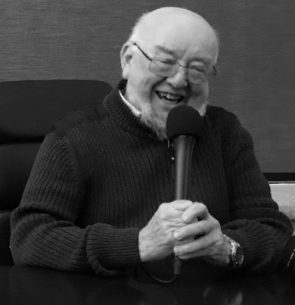 Each activity is linked to a specific section of Thomas Keneally’s interview and the relevant portion of the interview is noted at the beginning of the activity. A broad range of synthesising tasks has been developed, from which teachers may choose as they think appropriate. This section relates to 8:54 mins–9:48 mins of the interview. Keneally remarks that, growing up, he thought that ‘literature belonged somewhere else so you had to write about somewhere else’. Keneally recalls that Australia didn’t have ‘validity as a literary venue’ at that stage. Discuss with your class the images they have come to expect of the English landscape – elicit responses about the lush greenery, hedgerows, fields and meadows. any further insights into the appearance and ambience of the English countryside. Show your students a collection of Australian landscape images. Discuss the similarities and differences between the two types of landscapes. Present your students with the poetry of Judith Wright and Kenneth Slessor. The Killer, Legend, Bora Ring and Northern River are good places to start for Judith Wright. South Country and Wild Grapes are suggestions for Kenneth Slessor. Ask students to analyse the poems for descriptions of the landscape and other Australian themes. Students may be interested to listen to The Garret interviews with both Alex Miller and Tony Birch who also talk about writing Australian landscapes. After analysing the landscape images and Australian poetry, students create a list of ‘criteria’ to describe the types of landscape images that Australian literature conjures up. Students should then use this list as inspiration to create their own poem that celebrates the landscape of Australia today. This activity relates to 6:22 mins–7:27 mins of the interview. Keneally describes author Patrick White as a ‘lonely nunatak of excellence, rising out of the great Arctic-Antarctic plain of Australian Philistines,’ and calls him ‘an angry prophet’. Keneally remarks that White didn’t want to be the friend of the Australian people but instead wanted to ‘blast us with lightning and wake us up’. Watch this interview of Patrick White from ABC’s Four Corners in 1973. Whilst watching, encourage students to take note of the comments that White makes regarding Australia and his uncertainty of living here (particularly Sydney). Consider the official press release issued when White won the Nobel Prize for Literature in 1973. How are his novels described? How do you interpret his award ‘for an epic and psychological narrative art which has introduced a new continent to literature’? Discuss the work of White in broad terms – of the challenges his writing made to accepted ideas. Encourage students to read his biography and research the novels he wrote. Students and teachers may also be interested to note the non-fiction book, Christos Tsiolkas on Patrick White, which is part of the new ‘Writers on Writers’ series by Black Inc.
How do you think Keneally arrived at the conclusion that White was ‘an angry prophet’? What examples from White’s work and biography can you find that confirm or challenge this statement by Keneally? Ask students to select an issue that they’re passionate about or believe has been misconstrued in the media. In a format of their choice (such as poetry, script, short story, description, speech), students become ‘angry prophets’ about this issue and reveal the true facts or their true opinions about the issue. Students should avoid turning their writing into an angry tirade, but rather focus on developing nuances throughout their piece that reflect a thoughtful, intelligent and subtle understanding of the particular matter they choose to write about. This activity relates to 14:45 mins–15:03 mins of the interview. In this part of the interview, Keneally stresses the importance of becoming interested in the people he saw as a motivation for his writing, and using this fascination to inspire his stories. Direct your students to observe the people around them for a period of several days. Speak to your students about the importance of recording physical and discernible traits, but also about making inferences about emotional states. Students should keep notes and comments as they observe to use as inspiration for a creative task. A monologue, a dialogue between several characters, a short story or poetry would be suitable formats. This activity relates to Keneally’s statement at 45:07 mins of the interview. However, the sentiments of this statement run throughout his interview. Keneally states, ‘Australian social history is phenomenal’, and throughout his interview, he refers to the lived experiences of many Australians, including convicts Henry Savery and James Tucker, Henry Parkes, Bennelong and Brit Ivory Turner. Under your instruction, direct students to research the social history of an Australian figure – well known or otherwise. They should collect notes along the way to form an accurate account of their chosen character’s life. Once they have collected enough information, students should undertake the writing of a vignette. You may need to explain the characteristics of a vignette to your class to help them undertake this task. This activity relates to 27:53 mins–29:28 mins of the interview. Keneally, when speaking of Schindler’s Ark, discusses the nervousness that his interviewees felt whilst sharing their stories of survival of the Holocaust. They were fuelled by tensions about Holocaust denial, as well as the need to be factual for the sake of their fellow survivors. Discuss with your students what they think might be the best techniques for interviewing someone and create a list of these together. Select footage of interviewers/interviewees that you believe demonstrate some of the best qualities of the craft. You could select popular US television show hosts such as Barbara Walters or Oprah Winfrey, David Letterman or Larry King, for which there are many clips available, or research Australian interviewers. You could even show excerpts from particularly bad interviews for contrast. Instruct students that they will be interviewing someone from their own lives and to create a series of questions to ask them. The responses given will form the basis of a creative non-fiction piece. Using the list of questions students have generated in the previous activity, direct them to undertake their interviews and record the responses (a recording of the interview may prove to be most useful in this instance). Using the responses, students should focus on one particular area, emotion, scene or event that shaped their interviewee’s life (as expressed in their responses to their interview questions). Students will then craft this into a creative piece, staying true to the detail, description and significance as conveyed by the interviewee. This task celebrates the style of Keneally’s work with his daughter, Meg. The Unmourned has been a labour of collaborative love between the two and this rich assessment task asks students to undertake a process of collaborative writing themselves. Unit Suitable For Australian Senior Secondary Curriculum: English Unit 2, with some lessons suitable with adaptations to suit AC: English Year 10. Emma Jenkins is a teacher of six years’ experience who has taught English from years 7 to 12. She is currently the Tasmanian Association for the Teaching of English’s (TATE) state delegate to the National Council of AATE. Alongside English, Emma’s other classroom passion is History and she thoroughly enjoys teaching Australian history and Europe at war. Emma is currently effecting cross curricular approaches to the teaching of English and the Humanities at Mount Carmel College in Hobart, Tasmania.